I’m going to spend time over the course of the next couple of months perusing the best apologetics resources out there. Here in San Francisco, many of those I study the Bible with don’t have a basic belief in God, a trust in the Bible, or an awareness of, or belief in, core Christian doctrines. I would like to prepare myself as well as possible for any encounters with people God may send, and would also like to be able to teach other church members to do the same. How can the Bible be taken seriously? How do you know it hasn’t been rewritten over the years? How could a loving God send anyone to hell/allow evil to exist? Don’t you think it’s arrogant to say Christianity is the only path to God? Can’t God be found in other religions? Do heaven and hell actually exist? Was Jesus the Son of God, or was he simply a good teacher? Hasn’t science proven that Christianity is a fraud? F.F. Bruce – The New Testament Documents: Are They Reliable? Am I leaving anything out? If you know of a good resource please let me know. A new nail is growing underneath the old one! 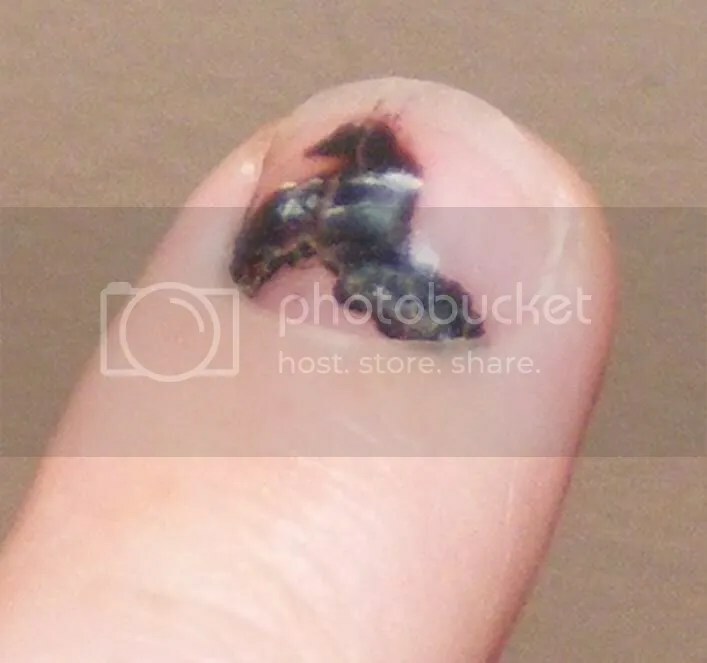 This is the weirdest thing that has ever happened to a fingernail of mine. I really liked Lee Strobel’s “The Case for a Creator.” He has a couple of other books that are almost as good: “The Case for Faith” and “The Case for Christ.” He interviews experts in the fields of science and theology. He asks the hard questions, and they provide some very good answers. I am a huge fan of C.S. Lewis “Mere Christianity.” Many of his points continue to speak to inquisitive seekers today. You have definitely got to add Timothy Keller’s “The Reason for God” to you list. Amazing book dealing with postmodern apologetics. Tim Keller is a minister in Manhattan and has reached thousands of people in NYC with his new type of apologetics. Oh yeah, and while you’re at it, check out Ben Stein’s documentary “Expelled.” They showed it at Harding last semester. It’s really cool. Buster – I agree – C.S. Lewis is on it. I’ve been praying about your dad, btw. Daniel – thanks for the tip. I’ll add that one to the list. Wes… how’d you know i was looking for these resources right now??? thanks for listing these! Thanks Phil – keep ’em comin’ guys. I was browsing in a Christian bookstore a couple of days ago. I looked through Wayne Grudem’s “Systematic Theology” and found some good stuff about the origins and reliability of the Bible. It might be helpful, too. I believe Veritas Forum is progressively adding dozens and dozens of videos, audio, etc. – and as a bonus for us, these are even talks given largely to college student audiences. John Clayton’s book; The Source…has worked well for me with eggheads. Terry – I’ve already read Grudem’s book and I believe I already have it in my personal library too. I’ll try to find it and look through it again. It is a great book – thanks for the reminder. Benson – thanks bro – I’ll check that site out. Matt – great links – I’ll add those. Lynn – thank you too – I ordered that book today. Please share the link to this post with anyone you think it’ll help. Excellent list of resources,thanks! I’d recommend this site to add to your list: http://www.christianevidence.net – has a ton of evidence for Christianity!